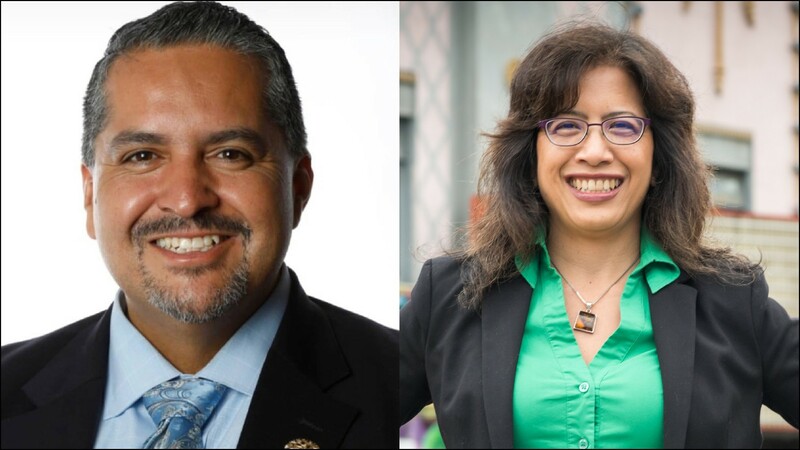 Councilmember Abel Guillen has mediated development conflicts and budget battles, but his opponent Nikki Fortunato Bas believes the councilmember should be more of an advocate. Nikki Fortunato Bas (left) backed Abel Guillen in 2014. When he first ran for Oakland City Council back in 2014, Abel Guillen had no idea the mess he was about to inherit. Quietly, and in apparent violation of state law, the council had negotiated a sweetheart deal with politically connected developer UrbanCore to hand over a valuable slice of surplus city property known as the E. 12th Street Remainder Parcel. UrbanCore was poised to receive a no-bid contract to buy the public land, located on the edge of Lake Merritt, and build a market-rate-only apartment tower on it. Newly elected, Guillen, who had nothing to do with the deal previously, found himself thrust into the middle of the controversy because the land was in his district. The deal blew up when the Express revealed that the city was about to violate the state Surplus Land Act. The council then abandoned the plan as activists demanded affordable housing and a transparent, competitive process. "During the campaign, no one ever talked to me about that," Guillen said about the blindsiding experience. On the council, Guillen ended up playing the role of arbiter between UrbanCore — which re-submitted a bid and was selected again as the developer, along with affordable housing nonprofit East Bay Asian Local Development Corporation — and outraged activists. "My job has been to bring both sides together and get agreements," Guillen said in a recent interview about his first four years in office, which has included helping negotiate several other of the city's largest real estate projects in Chinatown. About the E. 12th Street parcel in particular, he said, "I know people weren't happy, but at the end of the day, it's going to have 30 percent affordable housing, and it should be a model." Guillen has negotiated other tough deals. Most notably, he led the effort to pass the city's contentious midcycle budget in 2017. But some of Guillen's earliest supporters never wanted him to be a dealmaker. They wanted him to side with progressive groups, labor unions, and anti-gentrification activists in negotiations against real estate developers and for their budget priorities around housing, homelessness, and policing. So, many of these progressives are now opposing Guillen's bid for reelection, and one of his most prominent ex-supporters, Nikki Fortunato Bas, is running against him. Bas, a 21-year resident of D2, endorsed Guillen's campaign four years ago and even opened up her home to serve as a get-out-the-vote headquarters on Election Day. She and her husband also door-knocked for Guillen, and many of her close friends volunteered for his campaign. "We had high hopes he would live up to the progressive values he claimed at the time and be a partner with the community and labor," said Bas. "That didn't materialize, and a lot of us were disappointed." Bas describes herself as someone who never planned to run for office. Her career has been in the nonprofit sector running organizations like the East Bay Alliance for Sustainable Economy and the Partnership for Working Families. She got her start organizing in Oakland Chinatown in the 1990s working with Asian women against wage theft, and she was part of a grassroots movement that helped shift the nation's consciousness around sweatshop labor and corporate responsibility. More recently, she spearheaded work on the living wage, local hire, and ban the box policies at the former Oakland Army Base redevelopment, and she helped pass Measure FF, Oakland's $13.23 per hour minimum wage law in 2014. "We need to keep raising the floor," she said about her economic philosophy. Bas said she's running for council because, like some other Oakland residents, she has found herself repeatedly frustrated by the sense that most of the councilmembers are not as progressive as the majority of the city. She cited Measure LL, which created the police commission. Several councilmembers, including Guillen, initially supported a less independent version of the commission than what ended up on the ballot — but 83 percent of Oaklanders voted for the stronger measure. Bas described her campaign as an effort to bring "an ecosystem of actors who can share a progressive vision and move it forward together." While the E. 12th Street Remainder Parcel was a flashpoint for many, Bas said District 2 residents have been repeatedly frustrated with the unwillingness of the council to take on issues like gentrification, equitable planning and development, and homelessness. To signal clearly which side she'll take in these kinds of contentious debates, Bas has pledged not to accept campaign contributions from real estate developers and corporations. Guillen, however, rejects the notion that he isn't a dyed-in-the-wool progressive. He said that one example of his values in action was his city contracting ban for any business that helps build Trump's border wall. He has also co-authored Measure KK, the city's infrastructure and affordable housing bond, and has pushed to make sure city funds are equitably spent in all neighborhoods on street improvements. "At the end of the day, I've worked really hard to put our progressive values into practice," he said. "It's one thing to say it, but it's another to get things done, and I'm someone who makes a tangible difference in the lives of Oaklanders." This year, Guillen has high-profile endorsements from progressive leaders and several major labor unions, including the International Association of Firefighters Local 55, which represents Oakland's firefighters, and the Alameda County Building Construction & Trades Council. He's also endorsed by the Oakland Builders Alliance and Oakland Mayor Libby Schaaf. But other major unions that supported Guillen in 2014 are now strongly backing Bas, in part because they feel he didn't stand up enough for them during city-union negotiations and he hasn't pressed hard enough for policies they support on affordable housing and city services. They include SEIU 1021, IFPTE Local 21, and the Alameda County Labor Council — the county's umbrella labor organization. "I never crossed a picket line," said Guillen. "I showed them support by my words and actions." Guillen believes that the city is better off when both community and labor groups give up something, and developers and other business interests give up something, all to create a compromise that advances a project or policy. For several major Chinatown developments he mediated between the Chinatown Coalition and developers, the result, he said, is that all the projects have "a good package of community benefits." "The developers gave up a lot," he said. "Did the community get everything they wanted? No. But we're a lot better off." But Bas believes that developers and other business interests can afford to give more to the city's residents in terms of affordable housing, good jobs, and other community benefits, and she thinks the district wants someone who will push harder.